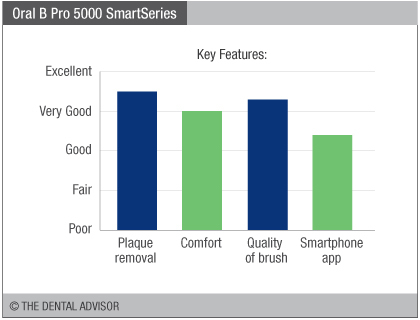 The Oral-B® PRO 5000 SmartSeries™ is the world’s first rechargeable electric toothbrush with Bluetooth® 4.0 Connectivity that works with the Oral-B® App, available as a free download for Apple and Android smartphones. 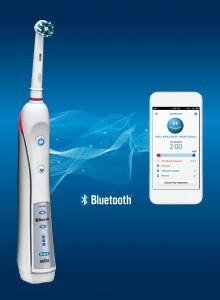 Once connected to Bluetooth, users can customize their oral hygiene regimen by setting goals and receive real-time feedback regarding their brushing habits. The app automatically tracks and stores the last 30 brushing sessions. The brush has five cleaning modes: Daily Clean, Gum Care, Sensitive, Whitening, and Deep Clean. The 3D Cleaning Action oscillates, rotates and pulsates to break up and remove plaque. 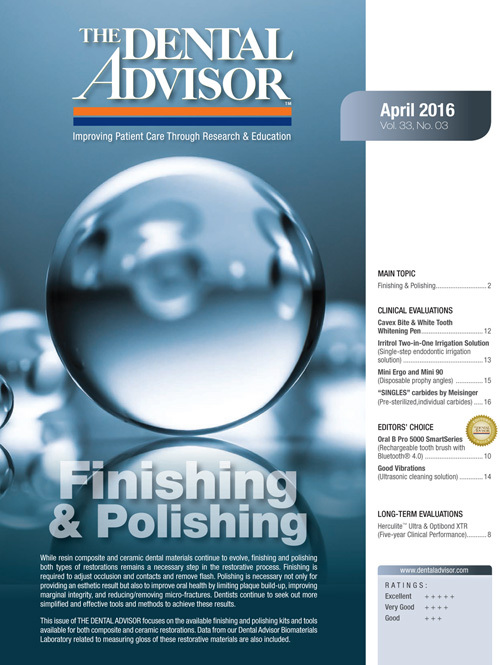 A systematic review by the independent Cochrane Collaboration group in 2014 concluded that oscillating-rotating, the technology used by Oral-B power brushes, was the only type of power brush that consistently reduced plaque and gingivitis more effectively than manual toothbrush in both the short and long term. 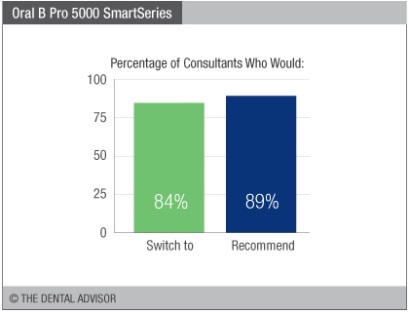 The Oral-B PRO 5000 SmartSeries also has a pressure sensor which alerts the user when too much pressure is applied and an in-handle timer which pulses every 30 seconds to remind the user to move to another quadrant thus promoting a 2-minute cleaning. In fact, research has shown that users who use this Oral-B Bluetooth enabled brush together with the Oral-B App brush for 2 minutes 24 sec on average! The package includes the rechargeable toothbrush handle, a CrossAction brush head, a charging station with brush head storage, and a travel case. 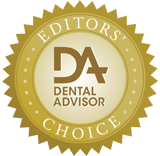 Five additional brush heads were included in this evaluation: Floss Action, Pro White, Sensitive Gum Care, Deep Sweep, and Interproximal Clean. 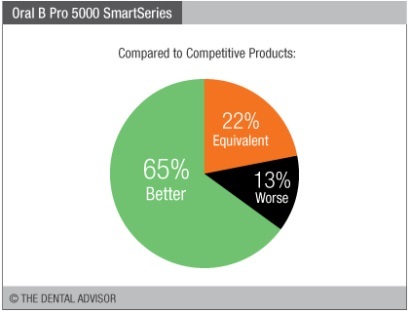 Oral-B PRO 5000 SmartSeries was used daily by 46 dental professionals during a 60-day evaluation period. This electric toothbrush received a 91% clinical rating.